CLEARWATER -- It’s a Saturday evening, shortly after 7, and people are filing into Union Street UMC. Some men wear shirts with floral or palm tree prints. Some women wear black skirts adorned with colorful island flowers. Children with a Pacific Island heritage sing during worship at Union Street UMC's Micronesian Mission as their parents look on. Photo by B.C. Manion. Video provided by Nancy Mayeux. They are the sons and daughters of the Federated States of Micronesia. Recently, they joined hands and hearts to form Union Street’s Micronesian Mission, believed to be the only United Methodist mission of its kind in the continental U.S.
As the service proceeds, lay leaders read passages from the Bible and share lessons. They speak in Pohnpean, a language of their native Pacific Island country northeast of Australia. Guiding the development of the mission is Rev. Nancy Mayeux, Union Street pastor, who also shepherds an English-speaking congregation and a Hispanic mission. The Micronesian congregation sprang up almost overnight a little more than a year ago. It started with church member Saker Meninzor and his wife, Jocelyn Sallel, attending services in English regularly with their children, Mayeux said. Occasionally, other Micronesians would join them. 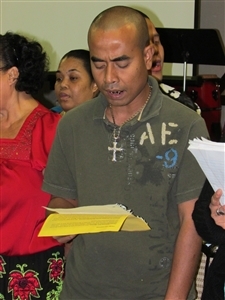 In November 2011, Meninzor told Mayeux that three groups of Micronesians were holding Bible studies in their homes – studying scripture, sharing prayer and singing hymns from the islands. He told the pastor that the groups would occasionally meet together at one home but were feeling cramped. Could they meet at the church? Mayeux asked Meninzor how many to expect. He suggested 35 or 40. People from the Federated States of Micronesia, an island country on the other side of the world, were recruited to work in health care facilities near Clearwater. Saker Meninzor, above, began attending Union Street UMC and gradually began bringing friends and family, forning the foundation of the new Micronesian Mission. Photo by B.C. Manion. “They started coming in and coming in,” Mayeux said. As the crowd surpassed Meninzor's estimate, she inwardly smiled. On that very day, church leaders had held a business meeting and estimated 10 percent growth annually for the next five years, a figure that Mayeux had thought too conservative. “It was like God was saying, ‘Don’t put me in a box. Don’t underestimate what I can do,’” the pastor said. Now as many as 125 people attend the Micronesian worship service, which coincides with the church's Saturday Kids Klub. Attendance rivals or exceeds the Anglo and Hispanic services. In January, the Florida Conference's New Church Development Committee recognized the Micronesian congregation as an official mission, making it eligible for five years of financial support. 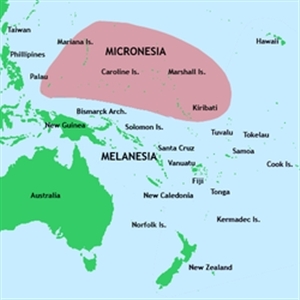 The Micronesian Mission also has joined the denomination's Pacific Island Caucus, made up of about 80 churches, making it eligible for grants through the Pacific Island Ministry Plan approved by the 2012 General Conference. Union Street already received $15,000, intended primarily to nurture its budding Micronesian ministry, through the General Board of Global Ministries' Racial-Ethnic Local Church grant program. Rev. 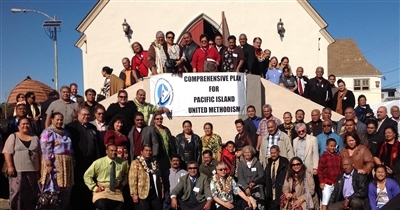 Nancy Mayeux and Micronesian Mission member Wanihda Meninzor were the only representatives of a Micronesian UMC congregation at a national Pacific Island Ministry Plan conference in San Francisco in late 2012. Photo from Union Street UMC. Rev. Mont Duncan, New Church Development executive director, said the mission was largely an unexpected gift, but he credits Mayeux with recognizing and cultivating it. "Nancy has a real heart for ethnic groups of people … and a real spirit of missional outreach," Duncan said. "The church is meeting a need for faith development in a growing community in that area. … The New Church Development Committee was delighted to support it." Unlike many of the church's Hispanic worshipers, most Micronesians speak English. Even so, they choose to worship in Pohnpean. Mayeux understands. She learned from her mother that the native tongue can be a person's "heart language." Union Street UMC Pastor Nancy Mayeux, above right, baptizes KaraLay Edwin, accompanied by her grandmother, Suwanihda Nason. 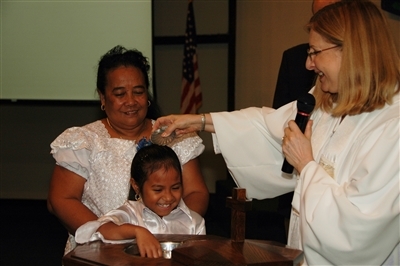 The child is one of about 40 baptized from the church's Micronesian Mission in the past year. 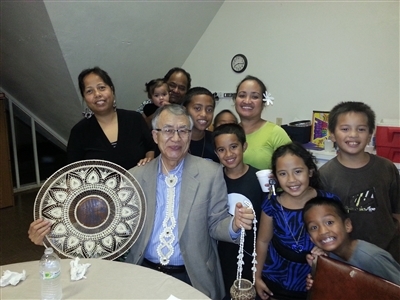 Below, Nam Jin "N.J." Jun, former general secretary of Asian American and Pacific Island Ministries, is showered with handmade island gifts during his visit last year before he retired from the General Board of Global Ministries. Photos from Union Street UMC. Meninzor said he knows the Micronesians were guided to Union Street UMC so they can grow in their relationship with God. Wanihda Meninzor, who works at Mease Dunedin Hospital, said a community of Micronesians developed in the Clearwater/Dunedin area because people from the islands were recruited to the area for work. Micronesians can work legally in America through a special compact between Mircronesia and the U.S.
Mayeux said the Micronesian culture reminds her of the early days of the church. When someone loses a job, for instance, another family will take the person in. Community members also share transportation and take care of each other’s children. “They all support and help each other. It’s the way we should be,” said Diana Crisler, Union Street lay leader. Despite cultural differences – including four worship services a week in three languages – Union Street remains “one body” committed to being the hands and feet of Jesus, Mayeux said. It’s not unusual for members of the Kids Klub to attend each others’ meetings or for members of all three groups to worship together on Sunday. Members from all three groups also take part in church ministries, which serve members and the community at large, Mayeux said. * B.C. Manion is a freelance writer in the Tampa area.